Carte professionnelle de transaction n° 5108T. Caisse de garantie transaction : CEGI. Montant caisse garantie : 30000 €. 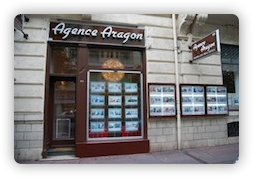 Founded in 1935, Agence Aragon is one of the oldest estate agencies in Nice, Côte d'Azur. Located on the Boulevard Gambetta, one of the main streets in Nice, the agency is in prime position to welcome clients from all corners of the world. Specialising in offering apartments within Nice city center, the agencys' good name and excellent reputation often receives the exclusive right to offer properties to their clients. Adverstising a wide range of products from property investments, recently renovated apartments to superb luxurious apartments with sea views, Agence Aragon can be sure to match you with the perfect property. The strongly motivated team is made of three estate agents who puts together, speak French, English, Italian and even Corsican. Our aim is not just sell properties, but to help and assist in all ways that we can, so that your move to the South of France goes as smoothly as possible. See the Nice Property multilingual article of the Agence Aragon.